I have several cake & frosting recipes to share because I make a new one practically every week, so today and tomorrow I am going to post two favorites, one old and one new and I’ll try to post the others once a week so you don’t get sick of all the cakes. This recipe was passed onto me from my Foodie Mama, Marina, last year and it quickly became my all-time favorite cake mix cake. It always gets rave reviews, perhaps mine being the loudest. :) I don’t even like Oreos (yes, I’m weird. I know. ), but I love this cake. The frosting. Oh, the frosting. It is like….heaven. It’s really all I need. I could just eat the bowl of frosting and skip the cake, but the cake does provide a good excuse for eating it. And while I know it doesn’t seem that appealing to be baking in 100+ temperatures (if you’re enjoying temps below 90, can I come move in with you for a few months??? ), this cake is served cold so it’s really nice to enjoy during these warmer months. Or cooler months. Or frigid. Really, it doesn’t matter. You can (and will) enjoy it any time. I was just trying to give you another reason to make it. Cake: Grease and flour two or three 8″ pans (Marina uses three, I use two because I don’t have three). 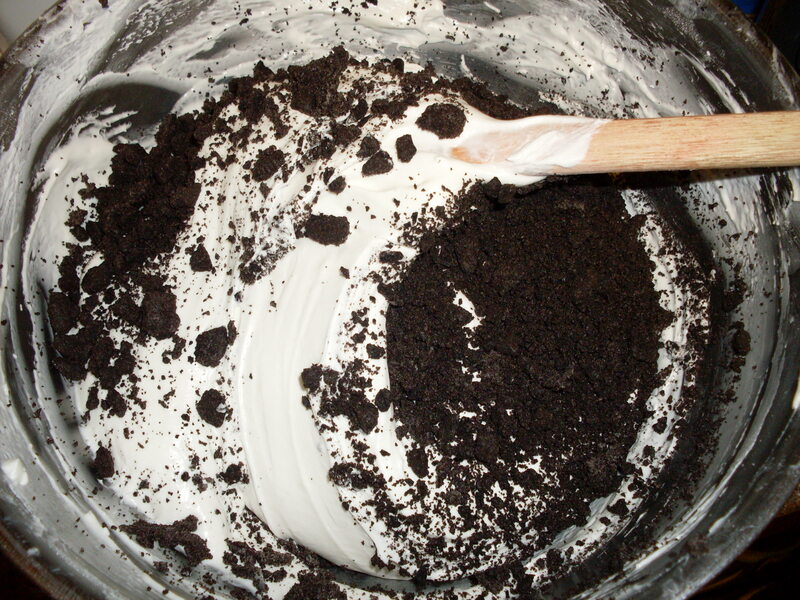 Prepare cake according to package directions (or recipe directions), stirring in the crushed Oreos to the batter before dividing between prepared pans. Bake as directed on box or in recipe, but start checking 5 (or more) minutes early if you choose to do three layers as they will bake faster. 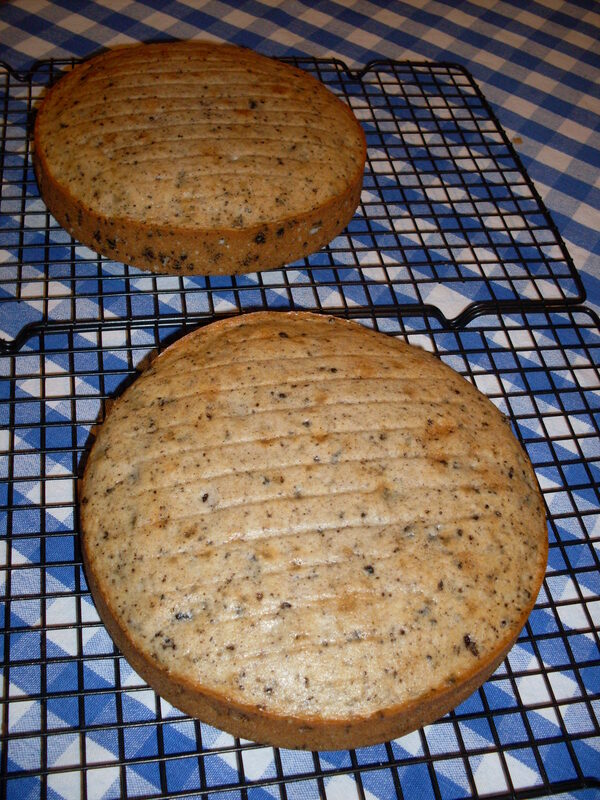 Remove cake layers from oven and allow to cool completely on cooling rack. Frosting: In mixer, cream the cream cheese and sugar. Add vanilla, mix well, and stir in Cool whip (do not beat it in or your frosting will turn out runny). Mix well. 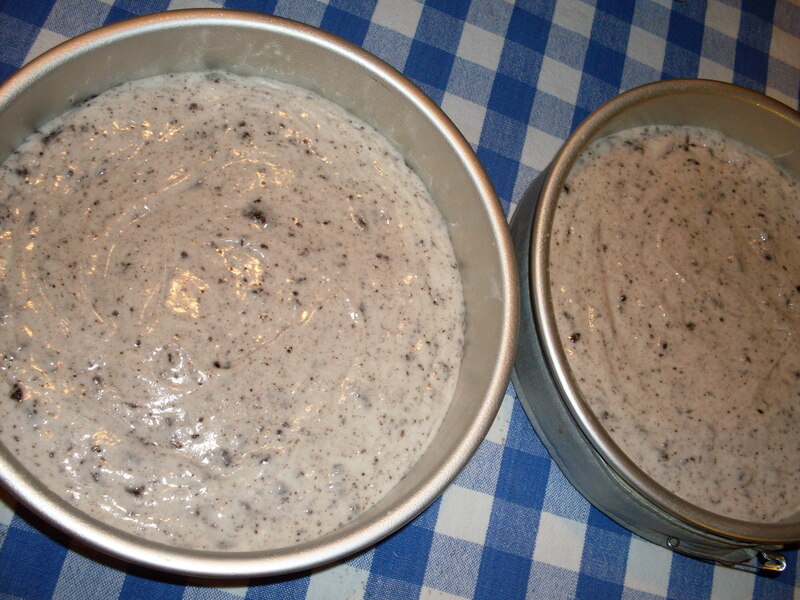 Fold in crushed Oreos until well blended & frost cooled cake. Refrigerate cake until ready to serve and refrigerate any leftovers. * Cake may be baked in a 13 x 9 inch pan or you can even make cupcakes; change the baking time according to the package instructions or your recipe. 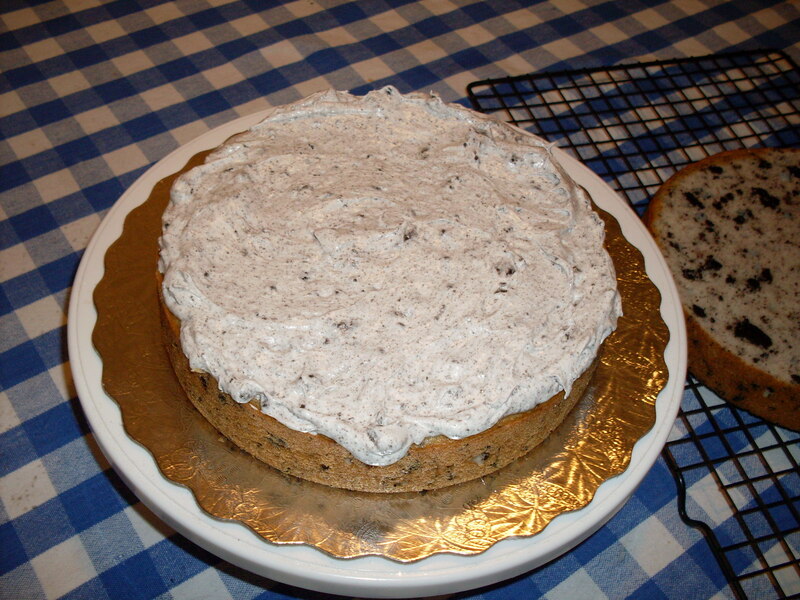 Posted in Cake & Frosting and tagged cookies and cream cake, easy, oreo cookie cake recipe. Bookmark the permalink. You said cool whip should be at room temperature. Did you mean thawed out? I never heard of having cool whip at room temperature. I meant room temperature, but I most recently made it with refrigerated Cool Whip and while it may have been a little harder to fold in since it firmed up the cream cheese a little, it still worked great! So either way will work. 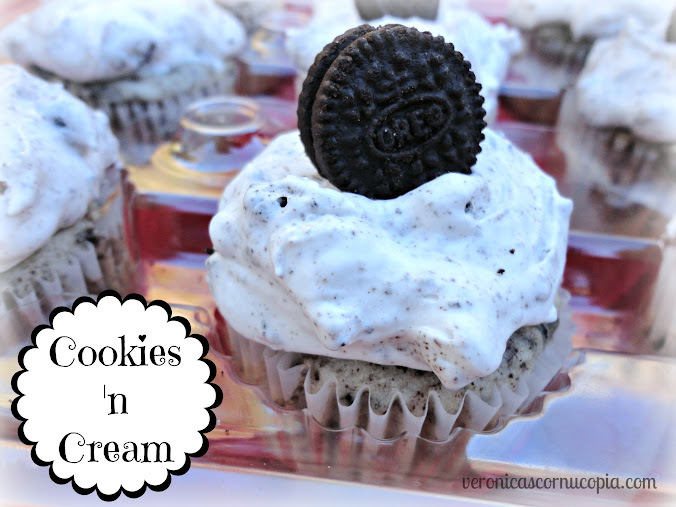 Crush the Oreo with or without the icing? 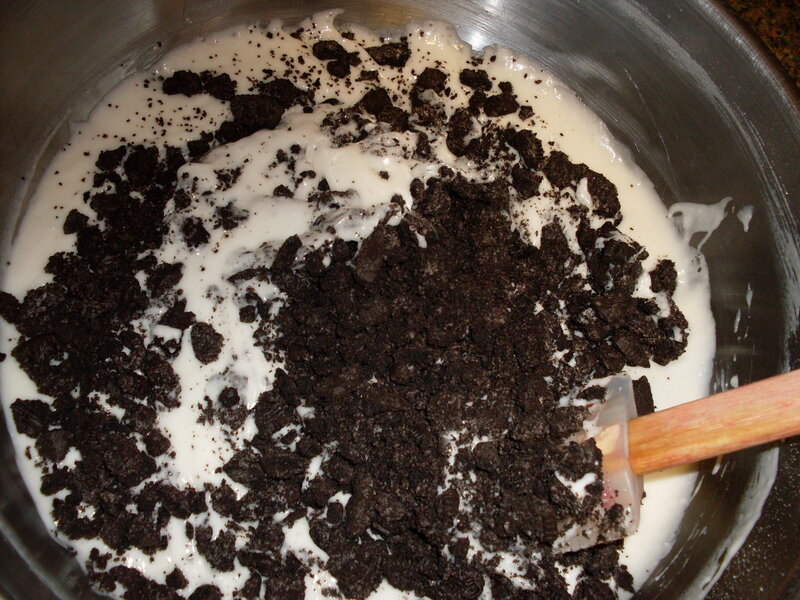 You crush the Oreos first, then stir into to the icing. That, I believe, is not what she meant. Her question was whether to crush the Oreos whole or to remove the filing and only crush the cookie portion. Aha, that makes more sense. :) Leave the filling in! You can remove it if you’d prefer less sweet. LOVE this cake!! How long will it keep in the refridgerator? 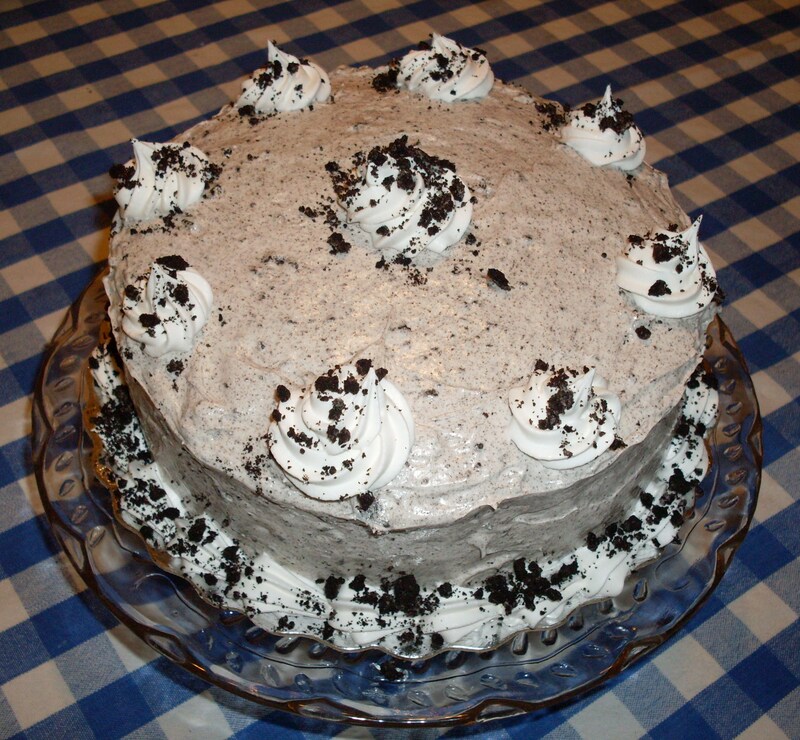 It’s best within 24 hours of making it, because over time the oreos draw moisture from the cake, making it more dry. It’s still tasty several days later, but much more dry. I suggest eating it within a day or two for best texture. Thank you for sharing! What icing recipe did you use for the piping and trim? Do you have to use Cool Whip? Would the sugar and cream cheese by itself be ok? You need something to lighten it, try replacing with real sweetened whipped cream if you don’t like cool whip. It was absolutely delicious! Thank you! I will make it again! no she didnt it only looks like it i thought that 2! My husband made this for me back in March for my birthday and it was delicious!! So much so that he has requested it for his birthday this month! Thanks! Is this cake sturdy/dense enough to cover in fondant? I bet if you did a homemade cake recipe it would be fine — a recipe that uses shortening or butter, not oil. Since this cake needs to be refrigerated, oil would be better. Butter and shortening both get firm and will change the texture of a cake when refrigerated, won’t be nice and soft. made for my daughter’s birthday and everyone loved. thanks so much. Making for my daughter’s birthday today, she requested this cake. I hope I can do it justice; your instructions and pictures are great. So far, cake is made, now cooling. I can never get the frosting spread right, but have never tried adding the cool whip in it so we’ll see if that’s a factor. I used a chocolate cake mix and added the crushed oreos in the batter. Also using pre-made cream cheese frosting. Sounds delish but I bet it has the color of cement right? You can see the color in the photos. It does get more gray the more you mix it so I try not to mix too much. This looked delicious so I made it for my daughters birthday party. Sorry to say, not one of the 6 girls ate more than a quarter of the small pieces I gave them. I thought the cake was great but the frosting was too sweet for the majority of us. My 14 year old ate all of hers. And to give you an idea of the sizes between the nine of us, I served half of a 9″ double layer cake. I wonder if it would have been better for us if we didn’t to use so much or any powdered sugar. Or maybe even switched the sugar with prepared instant chocolate pudding! Maybe half pudding and half cool whip so there isn’t so much topping. Anyway, thank you for the recipe and the pictures that help guide the creation of this easy to make cake that looks fun and delicious. This is my husband’s FAVORITE cake mix!!! My family ask for it often!!!! Great recipe! So glad I came across this page, trying this out for my son’s birthday next week. But will need to cover in fondant so planning to eliminate the oreo icing (oreo+cream cheese) and just use vanilla icing to make it smooth and even. Have you tried just vanilla icing alone? Will that do? I have a Pillsbury vanilla icing tin with me. I was wondering is that cool whip on top of the cake or icing ? Yes, I used more cool whip to decorate! Pingback: Crazy Good Recipes you Need to try! 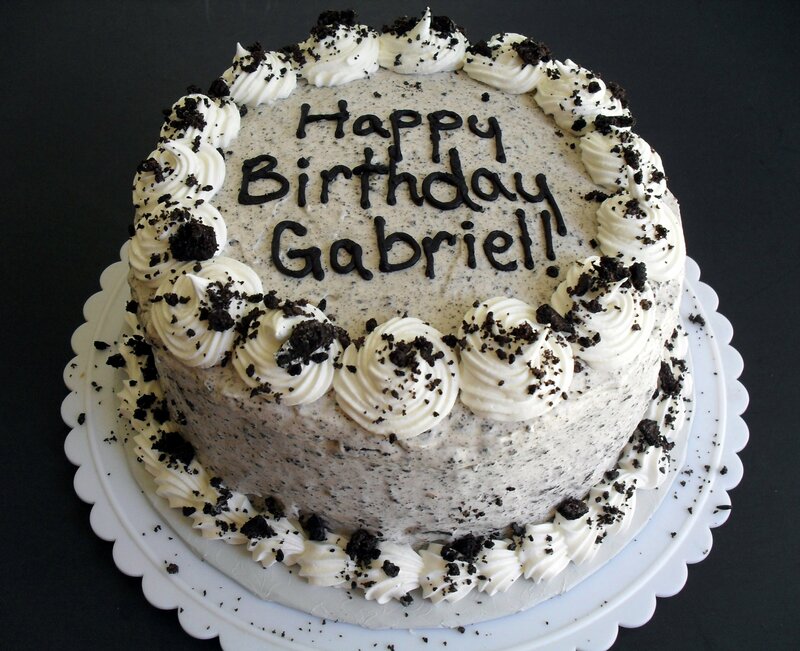 My husband luvs cookies and cream and wants it 4 his bday in bout a week so I’ll be making this and hope he likes it. I have made this cake before following exactly and my family loved it. My daughter LOVES the smores flavored Oreos. Anyone try a different flavor Oreo? Wondering if I did everything the same and used the smores Oreos if it would Be as good ??????? 1st time making this; changed the box recipe by adding 1 egg and swapping milk for the water. 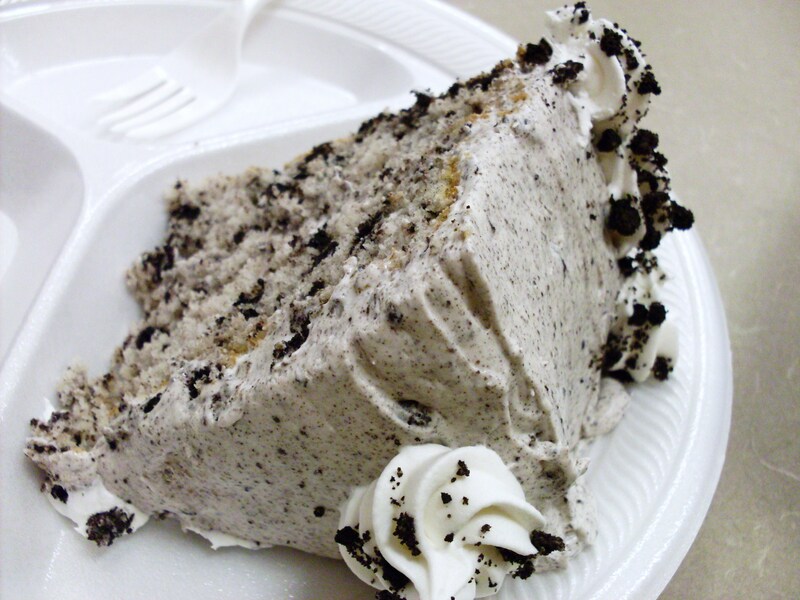 Everyone loved the Oreo cake; Got raves! Thanks! Do you think i could substitute a chocolate cake mix in for this and it would still taste good? I’ve tried this recipe before and it was a HIT for sure! Everyone loved it (thank you) however today I’m making chocolate cupcakes but would like to top them with this icing. Should I cut the recipe in 1/2 for that? Sorry for the late reply! This recipe will top over 2 dozen cupcakes so if you’re only making a dozen, yes, otherwise, no. Also, any leftovers are amazing eaten as a dessert itself! Do you substitute or add anything else to the batter for more moist like milk or butter milk or pudding mix?